Ahtziri and I are sitting on a stone garden bench outside the church in Riverside, California, where my children take piano lessons. In her hand is a stack of papers—typed forms for me to sign, neatly handwritten manuscript pages, and sketches of fictional characters with names and biographical information. I have been asked to mentor Ahtziri, a 17-year-old high school senior, through the process of writing a novel for her A.P. English class. I am not a novelist, but I am a poet, and I direct a nonprofit—the Inlandia Institute—whose mission is to support literary activity, in all of its forms, throughout inland Southern California, aka the Inland Empire or I.E. The Inland Empire has been in the news a lot lately, with the most recent mass shooting and largest terror attack on U.S. soil since September 11 taking place here. But we are far more than a news headline. Until the recent shootings in San Bernardino, the Inland Empire was largely unknown, and until the Inlandia Institute was formed, it lacked a cohesive literary identity, unlike Los Angeles or other major metropolitan areas, despite its long history of literary excellence. I was drawn to Inlandia because its mission so closely meshes with my own priorities: as a writer who calls this place home, as a mother who wants to see more opportunities for young people to engage their creativity, and as a locavore reader who wants to read and support local writers. I want more people to know and understand this region that I love, and the best way I know to do that is by seeing it through the eyes of the people who live here. Which is why I’ve agreed to mentor Ahtziri. And why the Inlandia Institute wants to build community by supporting creative literacy—fostering creative thinking and problem solving through narrative and storytelling—throughout inland Southern California. Like any other group, a community of readers and writers doesn’t spring up overnight; it grows gradually over the decades as people with a similar mindset find one another and begin to lay a foundation. But sometimes a catalyst comes along, and suddenly there is momentum. In the case of Inlandia, that catalyst was the publication of an anthology that recognized the depth and breadth of the literary writing by and about this region: Inlandia: A Literary Journey through California’s Empire, which Heyday published in 2006. Inlandia stacks greats such as Joan Didion and John Steinbeck and Norman Mailer alongside local jewels like novelist Susan Straight, who sets many of her stories in the fictional Rio Seco, a doppelgänger of Riverside; American Book Award winner Juan Delgado, whose poems evoke and celebrate the lives of the Mexican-American residents of San Bernardino; and Gordon Johnson, a Native American newspaper columnist for Riverside’s Press-Enterprise who writes with frank humor and grace about life on the reservation. The anthology elevated the lives of the people here, and put the Inland Empire, quite literally, on the “map”—now anyone around the country can pick up this book and gain an understanding of what it’s like to live here, and what the region is like. The nonprofit Inlandia began as a collaboration of the Riverside Public Library and Heyday to create cultural and literary events that celebrate the region’s writers and offer creative literary enrichment opportunities for people of all ages. Early projects included an ongoing series of writing workshops, programs in the schools, workshops for seniors on writing their life story, seminars on the “Business of Being a Writer,” and book readings and signings. By 2009, the program was so successful that it became an independent organization. A mission statement was drawn up to clearly define its footprint as the entire inland region (including both Riverside and San Bernardino counties and parts of neighboring Imperial and Inyo counties), and to focus on five core programs: adult creative literacy, publications, public literary events, children’s creative literacy, and a literary laureate program. That was the year I got involved with Inlandia. I was invited to present my work for an Inlandia author series at the library downtown, where I met Marion Mitchell-Wilson, the nonprofit’s first executive director. Marion thought my writing, publishing, and literary event experience would be a good fit for Inlandia. Soon she created a part-time coordinator position for me, which expanded over time, from founding a literary journal and running events to facilitating book publication, grant writing, and managing daily operations. When Marion was diagnosed with breast cancer, she asked if I would keep everything running until she got better. I couldn’t say no. Marion underwent treatment, came back, found the cancer had returned, and left again; she came back one last time before learning that the breast cancer was back yet again and had metastasized to her bones, liver, and brain. Within a matter of months, she had succumbed. But before she died, she called some of the people involved with Inlandia into her home and made a dramatic request: She wanted us to found an endowment in her name to ensure the continuity of the organization for decades to come. We raised $100,000 in six weeks. Building a literary community is not just about reading and writing; like any community, it is only as good as its people. People tend to unite in celebration of a cause they feel passionate about. That’s what I believe happened with the endowment. The people are also the reason I keep working with Inlandia. Over the past few years, I have had the privilege of collaborating with UC Riverside professor and current U.S. 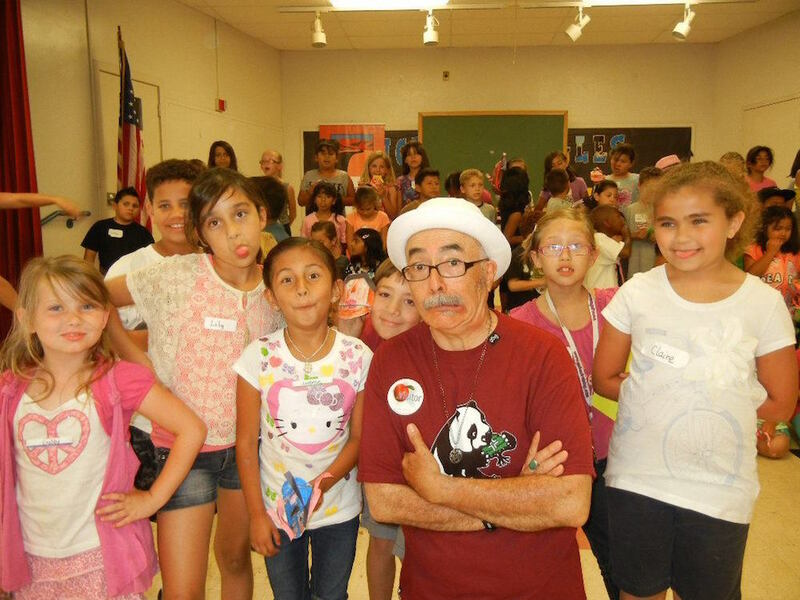 Poet Laureate Juan Felipe Herrera (who coined the term “Inlandia” in the first place) on a variety of projects, including a guerrilla-style poetry reading on the downtown Riverside pedestrian mall during the lunch hour, and an event at the Smiley Library in Redlands to collect poems for his unity poem. Juan Felipe Herrera, now U.S. poet laureate, conducts a choir during the Unity Fiesta at UC Riverside. Inlandia serves a vast swath of inland cities, from the Salton Sea to Temecula, from Wrightwood to Mecca. I am very attached to this region, where I’ve spent the better part of my adult life, even after living in places where the arts have deeper roots. But what the region lacks in deep roots it makes up for in diversity—both ethnic and socioeconomic—and its residents have a great appreciation for that. We are not San Francisco or Los Angeles, but we, too, have world-class museums and cultural events and spacious, beautiful libraries. And we have pride. 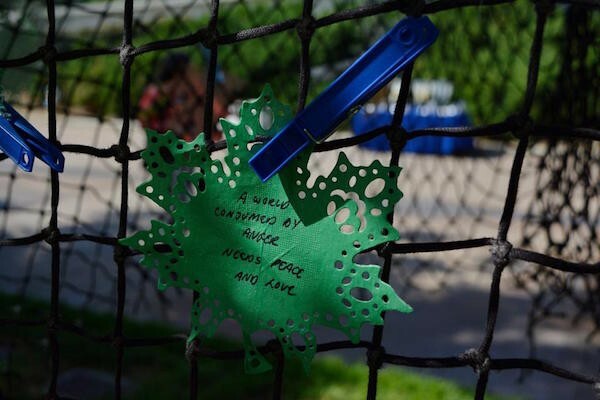 As I write this, I am surrounded by poems submitted to our “Poetry Box” during Riverside’s Long Night of Arts and Innovation, an event held downtown and sponsored by the city of Riverside every two years. The event brings together innovators in technology alongside arts and cultural organizations to showcase what Riverside has to offer. 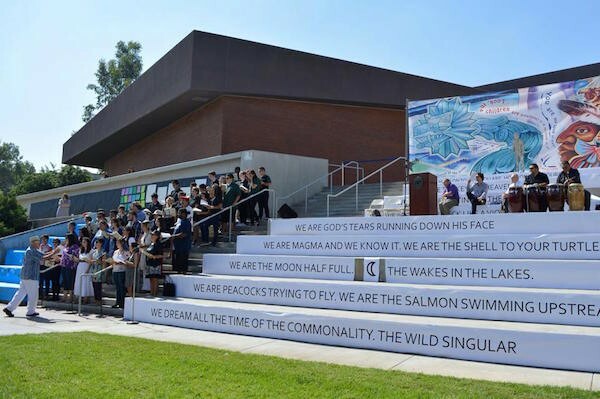 (Riverside’s tagline is the “City of Arts and Innovation.”) The Poetry Box was a space for people to play with words—to cut up and rearrange them into poetry on a large felt board, to add to a collaborative poem in a single notebook, or just to write with pens on blank paper. It was surprising to see how many people stopped, sat down, put pen to paper, and wrote a poem, some for the first time. The Poetry Box got to the core of what Inlandia is all about—building community, one word at a time. I love who we are, we Inlandians—and I revel in all of the places we’ve come from or have yet to go. I think of Ahtziri—wonder whether or not she will finish her novel. But you know what? The finishing doesn’t matter. It’s the starting that counts, and I don’t just want to see how the story ends. I want to see where it takes her. Cati Porter is author of the poetry collections Seven Floors Up and My Skies of Small Horses, founder and editor of Poemeleon: A Journal of Poetry, and executive director of the Inlandia Institute. "Living the Arts" is an arts engagement project of Zócalo Public Square and The James Irvine Foundation. Primary editor: Sarah Rothbard. Secondary editor: Paul Bisceglio. *Photos courtesy of Cati Porter.